Ever wanted to own your own private jet? That may now be possible, given that a number are now up for auction in China, it's reported. 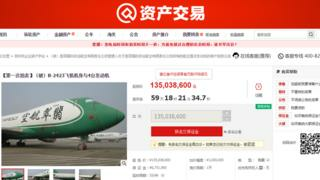 Three Boeing 747s have landed on the auction arm of Taobao, China's leading eBay-like service. Sadly, you'll need deep pockets to afford one of these jets - opening bids for the planes range from 122 to 135 million yuan ($18.5-20.4m; £13.7m-15.1m). Taobao directs potential buyers to make a security deposit for the planes before 20 October, and bids formally close on 20 November.